During the World War I, American jazz bands played at hospitals, rest camps and other venues, delighting doughboys and Europeans alike. 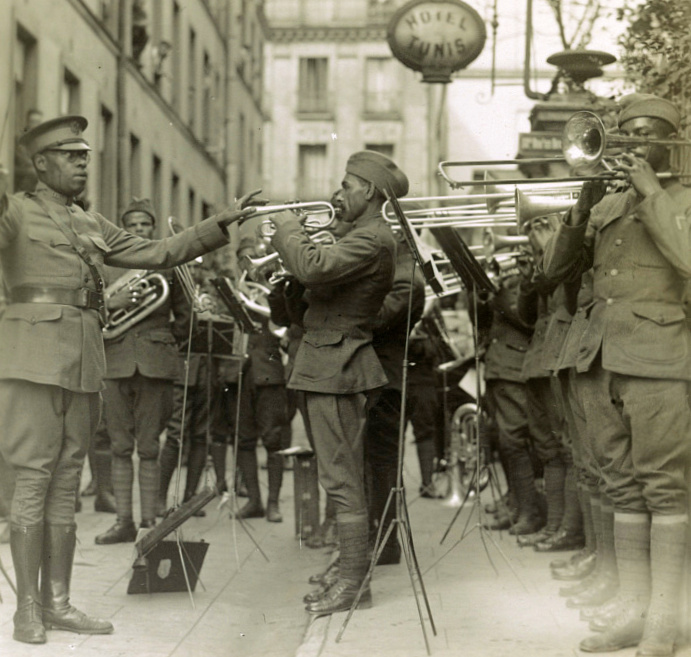 Lt. James Europe's military band entertained wounded American soldiers by playing jazz in the courtyard of a Paris hospital. Photo Library of Congress. 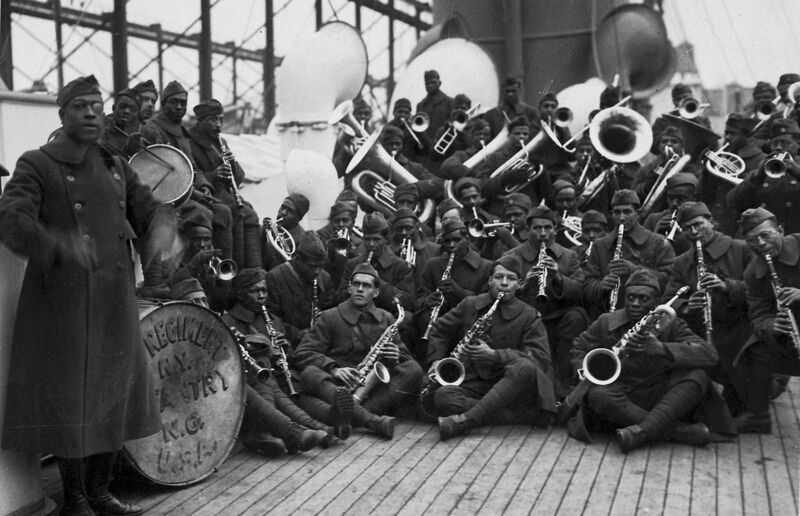 World War I brought many changes to the world, jazz not least among them. Some historians characterize it as America’s greatest cultural gift to the globe. It emerged not only as the favored soundtrack of the war, but also as a burgeoning cultural force for nascent, albeit halting and incomplete, integration. A new exhibit at The Library of Congress, “Echoes of the Great War: American Experiences of World War I,” demonstrates how African-American regimental outfits—such as E. E. Thompson’s 368th Regimental Band; George Dulf’s 370th Infantry “Old Eighth Illinois” Regiment Band; and, most famously, James Reese Europe’s 369th Regimental Band—came to define and spread the new musical form across continental Europe. James Europe’s band consisted of African-American jazz musicians such as Noble Sissle, but also over a dozen Puerto Rican players recruited by Europe himself from the Caribbean island. Some of its earliest performances overseas occurred at the health resort Aix-les-Bains. A world-famous destination frequented by the likes of J.P. Morgan, during the war it served as a site for recovering Allied soldiers, replete with hot springs, ancient Roman ruins and French and Italian architecture. Here Europe’s band regaled recovering troops with jazz compositions. “From the very first afternoon concert, when they opened with ‘Over There’ and the war-weary American soldiers responded by climbing on tables, shouting, waving their caps, and demanding that it be played again and again, the band was a great hit,” writes historian Reid Badger in his biography of Europe. This scene played out across France, pulling in European and American audiences alike. Troop trains “carrying Allied soldiers from everywhere,” passing the 369th, took in the sounds as “every head came out the window when we struck up a good old Dixie tune,” remembered Sissle. Even German prisoners forgot their incarceration, abandoned their labor and began to “pat their feet to the stirring American tune.” Jazz bands like the 369th played at hospitals, rest camps and numerous other venues. The jazz band led by Lt. James Europe (left) and the 369th Infantry Regiment returned from Europe on the SS Stockholm. The New York regiment, known as the "Black Rattlers" and composed mostly of black and Puerto Rican soldiers, was the first African-American regiment to serve in World War I. National Archives. An August 1918 performance at the Théâtre des Champs-Élysées in Paris by the 369th so impressed AEF General Tasker Bliss and his French counterparts that they asked the band to play in the French capital for eight more weeks. Another concert featuring the 369th at the Tuileries Gardens, along with some of the great bands from around Europe, drew 50,000 listeners. “Everywhere we gave a concert it was a riot,” Europe told an interviewer in 1919. Europe’s band knew of Cobb; many members disdained him, yet they understood the importance of a performing for the then-influential writer. “A full moon shone across the shell battered houses of the little town silhouetting the demolished steeples of a church nearby” as the sounds of artillery and machine gun fire echoed in the background, notes the historian Reid Badger of the 1918 performance. Parisians went wild for jazz after World War I. American dancer Josephine Baker and La Revue Negre became star attractions at the Théâtre des Champs-Élysées, where Lt. Europe's band played previously. Tragically, Europe died not long afterward, following an attack in Boston in 1919 by a disgruntled band member. This essay first appeared in the Library of Congress blog.